New call for entries: Ammado! Do you want to inspire people to make a difference? Well Ammado is offering you just that. 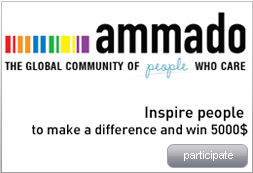 Ammado, which connects nonprofits, socially responsible companies and engaged individuals dedicated to positive change at a global and local level is looking for Video/Animation to generate a buzz around the ammado Giving Circle and inspire people to make a difference. There’s $5,000 to win divided in 3 prizes: 1st : 2500 USD 2nd : 1500 USD 3rd : 1000 USD You have until January 14th to participate, to start brainstorming!